Marigny, designed by Tal Leming, is a casual typeface that was drawn with serious typography in mind. It has the same basic proportions as classical ‘oldstyle’ typefaces (think of Garamond and friends) and these give it a similar typographic rhythm to one that we have known for several hundred years. The hand-rendered forms transform this familiar texture into something very warm and pleasant. In a way, dipping into a block of text set in Marigny is like putting on your favorite pair of comfortable slippers. I initially designed Marigny for use in paragraph length runs of text, but all of the weights, especially the Thin and Black, look just as great when used in large sizes. The informal forms that make blocks of text so appealing also give a handmade quality to headlines and logotypes. 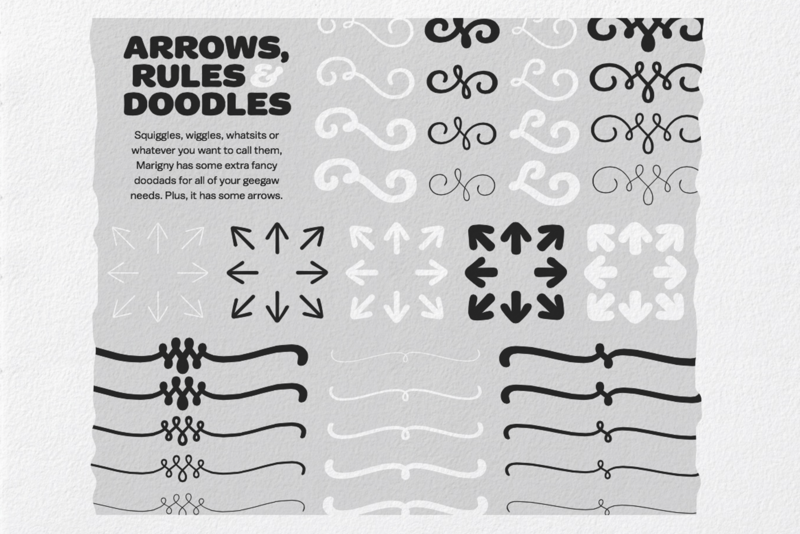 The family has a large set of the useful typographic sorts loved by considerate designers: ligatures, small caps, swashes, multiple figure styles and a handful of ornaments. Finally, as with all of my typefaces, this family works just as well on screen as it does on paper. 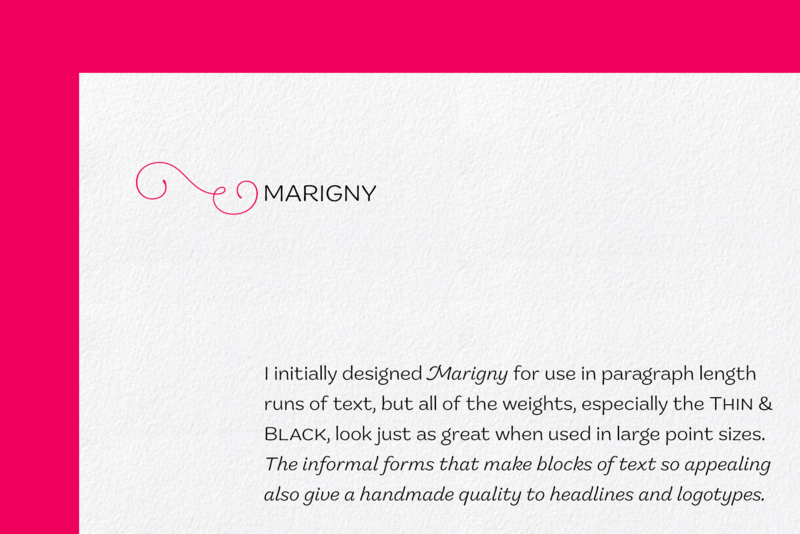 I have used Marigny for several personal projects over the last few years and it has always been a lot of fun to use. I really like this typeface and I hope you consider it for any text that you want to feel warm, welcoming and alive. Marigny in available in five feature-rich weights in Roman and Italic with built-in small caps, swash italics and ornaments.